From the Tools toolbar, use the Zoom tool to zoom in and zoom out in the Camera or Drawing view. • The keyboard shortcuts are  and . • When the Zoom In mode is selected, hold [Alt] as you click to zoom out. When you select the Zoom tool, its properties are displayed in the Tool Properties view. Enable the Zoom In mode in the Options section to zoom in when using the Zoom tool. 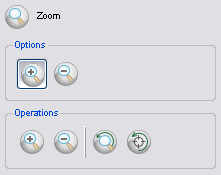 Enable the Zoom Out mode in the Options section to zoom out when using the Zoom tool. Use the Zoom In operation to perform a zoom in the Camera or Drawing view. • The keyboard shortcut is . Use the Zoom Out operation to perform a zoom out in the Camera or Drawing view. Use the Reset Zoom operation to restore the current zoom level to 100%. The Reset View restores the original display by resetting pan, rotation or zoom actions.